Read our Gold and the great stage of fools to learn more about why the dollar is so strong, at the expense of gold, but also why there are cracks in the US economy. Foreign investors purchased some $26 billion of T-bills in May, driven by fear of a trade war and the indecisive result of the Italian election. They were also attracted by higher bond yields, which hit a seven-year peak in May. The two largest Treasury holders, China and Japan, both increased their buying. Germany bought $12 billion more in April compared to March. However Russia sold off 84% of its US debt holdings between March and May, leaving just $14.9 billion in its US reserve account. That compares to $102 billion in December 2017. (see graph below). The sell-off corresponded with tough US sanctions imposed on Russian President Putin’s closest associates and Rusal, which produces 7% of the world’s aluminum. The dumping of US Treasuries by Russia caused barely a ripple among US Treasury officials and politicians, who know that the country only holds about 1/10 of the T-bills owned by China, which has the most of any country, $1.2 trillion. But it begs the question, what would happen if China started selling US Treasuries? The trade war with China is not going well and the evidence shows that China does not need the US as much as it thinks. China is warming to Russia through energy deals and is buying Iranian oil despite US sanctions. It’s One Belt, One Road initiative is key to its plan to exert Chinese hegemony and create a trading bloc without the need to trade with its former enemies: the US and Europe. Eventually China could stop buying US Treasuries altogether. How would that affect the US dollar? And more significantly, how would the US finance its $21.476 trillion debt if the anti-T-bill movement spread and the market for them dried up? Here we trace the origins of the dollar and its post-war pinnacle as the world’s reserve currency, to its current sickly state. Does the US dollar deserve to be the reserve currency, or in the words of former French finance minister and future president Valéry Giscard d’Estaing, should it continue to enjoy its “exorbitant privilege”? We think not. This article will explain why. In July 1944, as Allied troops were racing across Normandy to liberate Paris, delegates from 44 nations met at Bretton Woods, New Hampshire and agreed to “peg” their currencies to the US dollar, the only currency strong enough to meet the rising demands for international currency transactions. What made the dollar so attractive to use as an international currency, the world’s reserve currency, was each US dollar was based on 1/35th of an ounce of gold (35.20 US dollars an ounce), and the gold was to be held in the US Treasury. There’s a lesson not learned that reverberates throughout monetary history: when government, any government, comes under financial pressure they cannot resist printing money and debasing their currency to pay for debts. The US began to send larger and larger amounts of dollars overseas to fund their increasing trade deficits. The glut of US dollars held abroad began to threaten US gold reserves – remember US dollars were redeemable for gold – and worldwide demand for gold was soaring. By the late 1950’s US gold reserves had began to dwindle rapidly. In October of 1960 panic buying caused gold’s price to rise to over US$40 per oz. A night-time emergency call was made by the US Federal Reserve. The Bank of England was to immediately flood the gold market with enough supply to reduce and stabilize the price of gold. The US had just made it abundantly clear that stopping the drain of its gold reserves, and the depreciation of its currency against gold, was a huge priority. The US, the Bank of England and the central banks of West Germany, France, Switzerland, Italy, Belgium, the Netherlands, and Luxembourg then set up a gold sales consortium to prevent the market price of gold rising above US$35.20 per oz. This consortium was known as the London Gold Pool. Member banks were to provide a quota of gold into a central pool; the US Federal Reserve would match their combined contributions ounce to ounce. This meant that the dollar would now be backed not only by the gold in Fort Knox but all the other pool members’ gold as well. By early 1962, the Bank of England, the consortium’s buy/sell agent, through the London Gold Exchange, was buying gold on the dips and selling on the rise to cap its price. Until 1968 nearly 80% of newly mined gold passed through the London Gold Exchange, London being the world’s premier gold market. The London Gold Fix had been a daily morning ritual since September 1919 - the 3 pm Gold Fix was introduced in 1968 to coincide with the opening of the US markets. Despite the Cuban Missile Crisis and escalating tensions between Moscow and the US, gold prices remained fairly stable; the London Gold Pool was a success. With the Gulf of Tonkin incident in late 1964 and the acceleration of the Vietnam war in 1965, US Military spending exploded. This was compounded by President Lyndon B. Johnson's Great Society project spending and not raising taxes. By 1965 the London Gold Pool was selling more gold, suppressing the rise, than it was buying back on the increasingly fewer, and shallower, dips. Britain devalued the pound sterling in late 1967. The ramping up, in early 1968, of the Vietnam War – because of the Tet offensive and President Johnson’s agreeing to General Westmoreland’s proposed troop surge - brought renewed pressure on the dollar. Since Johnson refused to raise taxes to pay for the social welfare reforms undertaken earlier and the war in Vietnam, the US was now running massive balance of payment deficits with the world. In a little over a month London sold close to 20 times its usual amount of gold, over a 1,000 tons. France dropped out of the pool to send its dollars back to the US - for gold rather than Treasury debt. Fed chairman William McChesney-Martin said the US would defend the US$35 per oz gold price “down to the last ingot.” Several planeloads of gold were emergency airlifted from the US to London. Gold demand continued to escalate with the London Gold Pool selling 175 tons one day and the very next day selling an additional 225 tons. This broke the back of the London Gold Pool. Members were tired of draining their countries’ gold reserves to pay for the US’s Vietnam War and social reform policies. At the request of London Gold Pool members the Queen of England declared Friday, March the 15th a bank holiday. The London gold market remained closed for two weeks and the London Gold Pool was disbanded. Johnson was forced to reverse his decision to send hundreds of thousands more US troops to crush the Vietnamese resistance - instead he opened up peace talks. An official “two-tiered” price for gold was announced to the world - the official price of US$35.20 would remain for central banks dealings, the free market could find its own price. “...there came the March 1968 run on gold, which led to the collapse of the London Gold Pool. The U.S. government and Federal Reserve System, seeking to stave off the complete collapse of the dollar-gold exchange standard, felt obliged to take deflationary measures. The fed funds rate, which on October 25, 1967, had fallen to as low as 2.00 percent, rose to 5.13 percent on March 15, 1968, the day the gold pool collapsed. In February 1970 the closing gold price on the London market averaged US$34.99. On August 15, 1971, US President Nixon ended the convertibility of the dollar into gold. With gold finally demonetized, the Fed and the world’s central banks were now free from having to defend their gold reserves and a fixed dollar price of gold. The era of Bretton Woods was over. Recognizing that the US, and the rest of the world was going to need and use a lot of oil, and that Saudi Arabia wanted to sell the world’s largest economy (by far the US) more oil, Nixon and Saudi Arabia came to an agreement in 1973 whereby Saudi oil could only be purchased in US dollars. This caused an immediate and strong global demand for the buck. “Beginning in the mid-1970’s the American Century system of global economic dominance underwent a dramatic change. The oil price shocks of 1973-1974 and 1979 suddenly created enormous demand for the floating dollar. Oil importing countries from Germany to Argentina to Japan, all were faced with how to acquire export-based dollars to pay their expensive new oil import bills. The rise in the price of oil flooded OPEC with dollars that far exceeded domestic investment needs, and were therefore categorized as “surplus petrodollars.” A major share of these oil dollars came to London and New York banks where the new process of monetary petrodollar recycling was initiated. By 1975 all OPEC members had agreed to sell their oil only in US dollars - thus ushering in the period of US “petrodollar” dominance that continues to this day. In the 1960s French politician Valéry d’Estaing complained that the United States and its exporters enjoyed an “exorbitant privilege” due to the dollar’s status as the world’s reserve currency. He had a point. Because the dollar was, and is, the world’s currency, the US can borrow more cheaply than it could otherwise (lower interest rates), US banks and companies can conveniently do cross-border business using their own currency, and when there is geopolitical tension in the world, central banks and investors buy US Treasuries, keeping the dollar high and the United States insulated from the conflict. A government that borrows in a foreign currency can go bankrupt; not so when it borrows from abroad in its own currency. The dollar is the most important unit of account for international trade, the main medium of exchange for settling international transactions, and the store of value for central banks. The Federal Reserve is the lender of last resort, as in the 2008-09 financial crisis, and is the most common currency for overseas borrowing by governments and businesses. Wall Street generates significant income from selling banking services in USD to the rest of the world, and the US manages the world’s most important settlement systems, allowing it to monitor and limit funds used for illegal activities. Size: Due to the size of the US and its economy, there are more dollars available than other currencies. 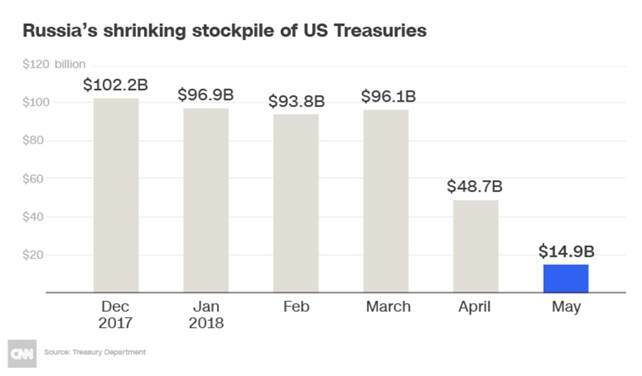 Stability: US Treasuries have historically been valued as a safe financial instrument that is backed by the US government, which pays its bills on time. Liquidity: Treasuries can easily be bought and sold without them losing much of their value, given the consistent strength of the dollar. The bond market for US Treasuries is considered the most liquid financial market in the world. While the attendees at the Bretton Woods conference in 1944 envisioned the USD enjoying these advantages in perpetuity, the reality is the greenback has been in decline for some time. 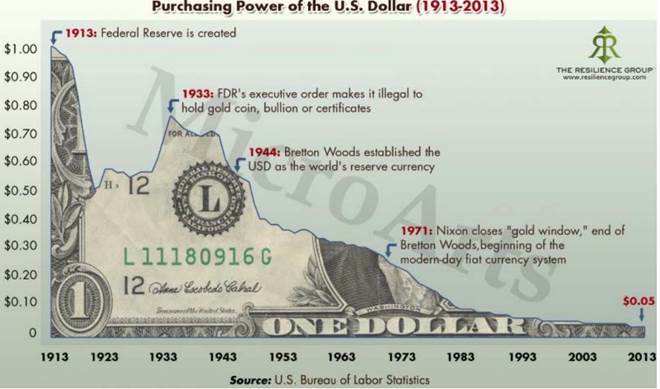 Since the Federal Reserve was created in 1913, the dollar has lost 95% of its value. (see graph below). Over a hundred years ago a buck was worth a buck; in 2013 it was valued at 5 cents – it’s worth eroded by inflation. Why? Because the US dollar still enjoyed exorbitant privilege. But as Bob Dylan once sang, “the times they are a changin’”. Jeffrey Sachs, writing for Project Syndicate, argues “the dollar punches far above America’s weight in the world economy,” producing just 22% of world output, but accounting for 50% or more of cross-border invoicing, reserves, settlements, liquidity and funding. Due to US fiscal and monetary mismanagement, as described above, the Bretton Woods financial system set up in 1944 collapsed. The breakdown of a gold-backed dollar led to high inflation in the US and Europe, then a fall in inflation in the early 1980s. Sachs argues the turmoil of the dollar was a key factor in motivating Europe to embark on monetary union, resulting in the euro’s launch in 1999. Same with America’s mishandling of the 1997 Asian debt crisis which led to China wanting to internationalize the renminbi, or Chinese yuan. The 2008-09 financial crisis which started in the US through the sub-prime mortgage debacle, was another flag to the rest of the world signaling a move away from the dollar toward other currencies, notes Sachs. 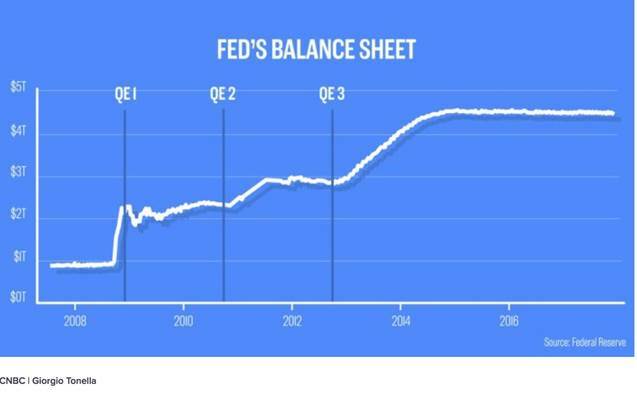 The quantitative easing program that saw the Fed’s assets skyrocket from $900 billion to $4.5 trillion between 2019 and 2015 (through the buying up of Treasuries, paid for by printing money), made it inexpensive for the US government to continue to borrow and spend - with rates close to zero. However what that did was show other countries that no longer was the United States following a sound fiscal policy; all they were doing was printing money. Countries started to diversify their foreign exchange reserves and reduce their dependence on the dollar. According to the IMF, USD foreign exchange reserves have dropped from 72% of the world’s forex in 2001 to 62% today. 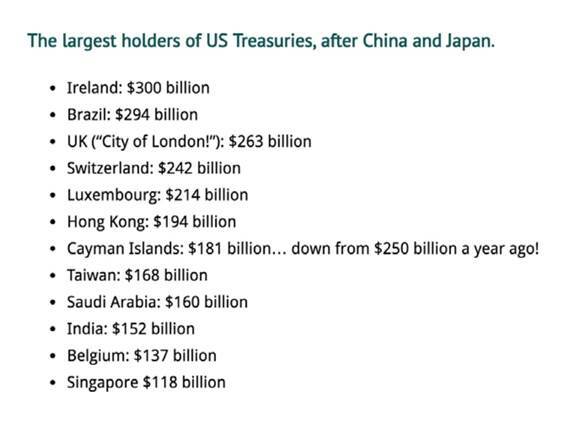 Of course, none of this matters to the two main buyers of US Treasuries, China and Japan (then Ireland and Brazil) - see table below - who have, up to recently, kept on buying. T-bills are still the best defense against financial, political and military turmoil (like trade wars). Not because of all the exorbitant privilege reasons outlined above, but because there are no other good alternatives. The euro isn’t stable because of problems within the European Union, the yuan isn’t yet ready, and the Japanese yen continues to lose value, DW points out. The dollar still accounts for 85% of all forex transactions despite only making up 25% of the world economy. So for years, the US dollar has been losing its exorbitant privilege. Only now, that loss of status is being exacerbated by the United States under the Trump Administration, which has engaged in harmful trade disputes that will actually weaken the dollar, the evidence suggests. Starting in March, Trump through the US Commerce Department levied import duties on steel and aluminum, implicitly targeting China for overproducing these metals, causing prices to decline and hurting US steel plants. As we all know, trade tensions between the two economic superpowers have escalated. The latest round involves more tariffs on a proposed $200 billion worth of Chinese goods plus another $267 billion. There are currently 25% tariffs on $50 billion in Chinese-made goods coming into the US. For its part, China has promised to retaliate by subjecting 85% of $110 billion worth of American imports to tariffs. And it’s not just China that is distancing itself from the US as it becomes more protectionist and isolationist. The European Union is looking at ways to circumvent US sanctions on Iran, by working around the dollar payments systems - in effect setting up its own SWIFT (Trump said in May that “any nation that helps Iran in its quest for nuclear weapons could be strongly sanctioned” and signed an executive order re-imposing sanctions on any foreign company that continues to do business with Iran). SWIFT, the Society for Worldwide Interbank Financial Telecommunications, is the communications system used for transferring money between countries. Before SWIFT, the only way to transfer money overseas between banks was through telex. “How long will it be before the world’s businesses and governments are running to Shanghai rather than Wall Street to float their renminbi bonds?” asks Sachs. The Financial Times chimed in that there are limits to the dollar’s exorbitant privilege, namely that money currently moving into US Treasuries is going into longer-dated bonds (ie 10 years or more), helping to push down yields on shorter-dated bonds. This “flattening of the yield curve” makes it harder for banks to make money and “implies growing concern for the strength of the economy,” notes the FT, adding that higher US yields are pushing up the dollar making it harder for US exporters. A flattening yield curve also historically has signalled the beginning of a recession. Back to the trade war with China, while Beijing has tried to placate foreign companies like Exxon Mobil which is planning on spending $10 billion on an LNG terminal in Guandong province - due to fears of losing foreign investment (Read our The road to war: China’s kryptonite - Part 2 for more on China’s vulnerabilities) - the other side of the coin is that as the trade war with China continues, the US is likely to feel more of the pain. Why? As Bloomberg argues, that’s because so far, the import tariffs have avoided consumer goods, but that will change if the planned (total) $467 billion in tariffs come into effect. 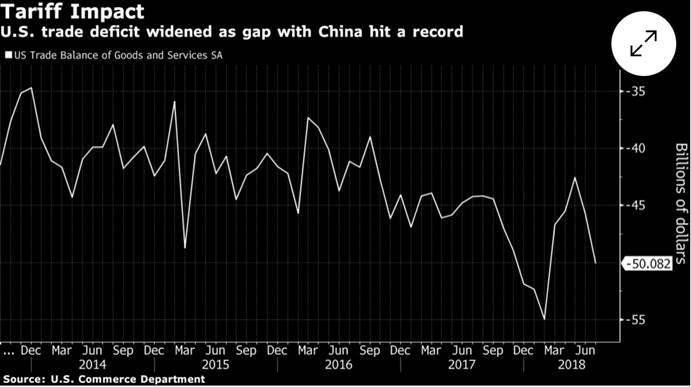 “As the scope of tariffs extends to more Chinese exports, the marginal side effects will likely rise for the U.S., and the marginal damage to China will likely decline,” Bloomberg quotes Deutsche Bank AG economists Zhiwei Zhang and Yi Xiong. They estimate the $200 billion list has $78 billion worth of consumer goods versus only $3.7 billion in the $50 billion list. These import tariffs are no different from the GST we pay in Canada. They’re a tax that has to be paid by the company, that is being directly passed onto consumers. So much for Trump helping the average Joe and Jane, as he campaigned on. In fact some of Americans’ most basic essentials are all going up. Who cares if the economy is growing at 4% if your six-pack of Miller is going to take a bigger bite out of your pay check? The price of Coca-Cola and other carbonated drinks is going up due to the higher price of aluminum to make cans. Other products including beer, furniture, boats, motorcycles and campers are all going to cost more. 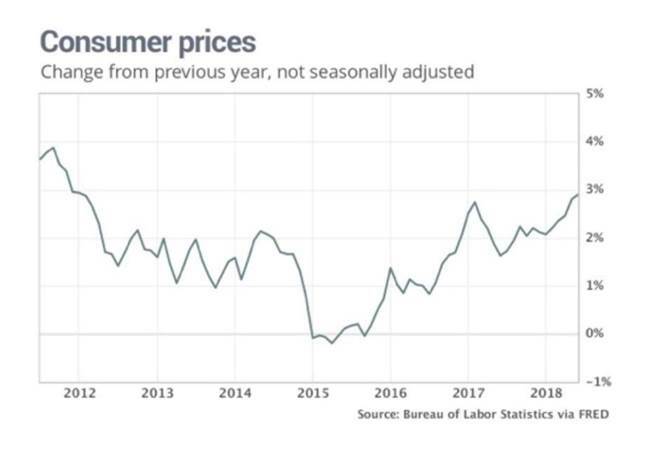 Overall, consumer prices have increased 2.9% in the last 12 months through June. Companies too are getting ticked off with Trump’s trade war. While the rationale was to lessen the overall trade deficit and particularly the trade deficit with China - and bring jobs back to the United States - none of that has happened. Ford, Apple and Intel are among the big US firms that have pushed back against Trump’s monkeying with their systems of supply-chain management through tariffs that make foreign parts more expensive. Ford for example cancelled plans to import its Focus Active crossover vehicle into the US from China. When Trump tweeted that the car “can now be BUILT IN THE USA,” Ford shot back that it isn’t profitable to manufacture it in the States. Apple had a similar response when Trump suggested the tech giant should build US plants when Apple complained about getting hit with tariffs, even though its parts are American-made but assembled in China. “[T]he burden of the proposed tariffs will fall much more heavily on the United States than on China,” the company said in a letter to US trade representative Robert Lighthizer. Indeed the trade deficit Trump is so anxious about is actually getting worse. In July it widened by the most in three years and the goods-trade deficit with China hit a record $36.8 billion. The widening gap with China was partly due to exports to China falling by 1%, driven by steep drops in shipments of aircraft and soybeans - both subject to Chinese countervailing duties. The yawning trade deficit is sure to weigh on growth in the third quarter; recall that Trump gloated about US GDP growing by 4.1% in Q2, but that was due to a boost in consumer spending driven by the tax cuts last December and a burst of soybean exports to China in an effort to avoid import tariffs. As for whether China will bend on deeper issues raised by Washington including removal of subsidies to state-owned enterprises, thus leveling the playing field with US companies, that seems unlikely. Chinese officials have indicated at least 20% of more than 100 demands from the US laid out in May, aren’t open to negotiation. Underlying the Trump Administration’s failure to bring the Chinese to the negotiating table is the fact that China actually doesn’t need the United States as much as America thinks they do. Trump and co think that all the US needs to do is keep piling on the tariffs and Chinese President Xi Jinping will bend to its will. The reality is quite different. China’s long-term objective is not to tie itself more closely to the US, but rather to become more economically independent. We see this through its One Belt, One Road initiative. It is global commerce on China’s terms. Xi is aiming to use China’s wealth and industrial know-how to create a new kind of globalisation that will dispense with the rules of the ageing Western-dominated institutions. The goal is to refashion the global economic order, drawing countries and companies more tightly into China’s orbit. The projects inherently serve China’s economic interests. With growth slowing at home, China is producing more steel, cement and machinery than the country needs. So Xi is looking to the rest of the world, particularly developing countries, to keep its economic engine going. In other words, One Belt,One Road is the means for creating a trading block that can function independent of its traditional Western trading partners. The “Belt” refers to a network of overland road and rail routes and oil and natural gas pipelines planned to run along the major Eurasian land bridges - China-Mongolia-Russia, China-Central and West Asia, China-Indochina Peninsula, China-Pakistan, Bangladesh-China-India-Myanmar. They’ll stretch from Xi’an in central China through Central Asia reaching as far as Moscow, Rotterdam and Venice. The “Road” is a network of ports and other coastal infrastructure projects from South and Southeast Asia to East Africa and the northern Mediterranean Sea. 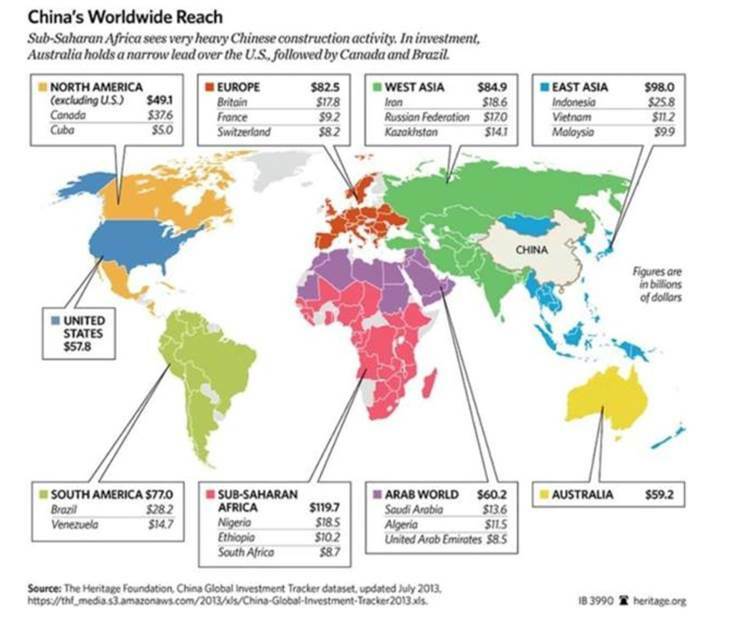 The China Global Investment Tracker is a comprehensive data set covering China’s well over $1 trillion in energy, mining, real estate and high-tech global investment and construction activity. An article published by the New York times ‘The World According to China’ by Gregor Aisch, Josh Keller and K.K.Rebecca Lai says China has displaced the United States and Europe as the leading financial power in large parts of the developing world. Here’s where China has the most influence, based on its share of foreign investment since 2005. Where Chinese companies once struggled to win orders in a competitive global market, that is starting to change, thanks to, ironically, the Chinese countervailing duties, which are making locally-made goods cheaper than their American-made counterparts. When Chinese citizens buy Chinese goods, the government is happy - the opposite of what Trump intended by his tariffs. In real life, Trump’s tariffs are unlikely to inflict enough pain on China to compel Xi to make concessions. Its huge domestic market is becoming more important to Chinese growth. But beyond even that, Beijing’s entire economic strategy is designed to replace critical foreign technology and products with homegrown alternatives it can control. Simply, the Communist Party prefers Chinese to buy Xiaomi phones and Geely cars, not iPhones and Buicks. That’s exactly what the much-feared “Made in China 2025” program is all about. The plan is to develop new, high-tech industries to compete with and eventually replace foreign rivals, at home and abroad. In that sense, it’s official policy to limit overseas involvement in the economy. The Green Book breaks down targets for dozens of industries that supply the 10 key sectors prioritized by Made in China 2025, which also include biotechnology, advanced rail equipment, and agricultural machinery. It sees Chinese companies taking a 56 percent share of the global market and 80 percent of the domestic market for integrated circuits by 2030. By 2025, they’re seen controlling 90 percent of the domestic market for new-energy vehicles including hybrid and pure electric cars, domestic mobile communication equipment, key parts of industrial robots, new energy, renewable energy equipment and energy storage equipment. 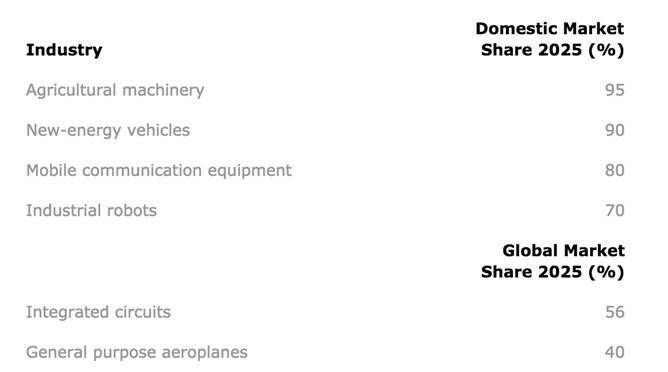 See below for a table of which industries are targeted. In another example of China’s pivot east, the country has recently turned to Russia to help solve its soybean problem. Soybeans are used in animal feed and Chinese citizens consume a lot of pork and beef. They currently import soybeans mostly from Brazil and the US but shipments have dropped significantly from the US since duties on American soybean imports were imposed. A joint venture between Chinese and Russian companies will invest $100 million over three years to build a soybean crusher and grain port in Russia, and lease 247,000 acres of farmland to grow wheat, corn and soybeans. The country is also reportedly building a new port in the northeast that will ship grain harvested in Russia by Chinese companies - as part of One Belt, One Road. Russia and China have been cozying up in other ways over the past few years. In 2014 Russian state-owned Gazprom signed an eye-popping $456 billion gas deal with China. The year previously, Rosneft agreed to double oil supplies to China in a deal valued at $270 billion, and in 2009 Russian oil giant Rosneft secured a $25 billion oil swap agreement with Beijing. 2014 was also the year that China really started to move away from the dollar. China agreed with Brazil on a $29 billion currency swap in an effort to promote the Chinese yuan as a reserve currency, and the Chinese and Russian central banks signed an agreement on yuan-ruble swaps to double trade between the two countries. The $150 billion deal, one of 38 accords inked in Moscow, is a way for Russia to move away from U.S. dollar-dominated settlements. China and Russia have been allies since the 1950s when they agreed to defend one another against an attack from US-backed Japan or its allies (China backed North Vietnam and North Korea) so continued cooperation is unsurprising. In 2001 Vladimir Putin and then-Chinese President Jiang Zemin signed a 20-year agreement to “increase trust between their militaries”. The two countries now regularly participate in joint maneuvers including joint naval exercises to counter US influence in the Asia Pacific region. Economic ties are also growing closer. On New Year's Day a second Sino-Russian oil pipeline began operating, doubling the amount of Russian crude being shipped to China. Last summer Xi Jinping and Vladimir Putin met in Russia to sign a deal whereby two Russian banks and a Chinese bank created a $10-billion investment fund that will finance infrastructure and development projects, and an $850 million innovation fund. The Russian banks are subject to US sanctions so the deal allows Russia to access non-Western capital, and to conduct transactions in yuan or rubles. The latest evidence of Chinese-Russian business ties involves a new crude oil futures contract, priced in yuan and convertible into gold. The Shanghai-based contract will allow oil exporters like Russia and Iran to dodge US sanctions against them by trading oil in yuan rather than US dollars. In early March the Russian State Space Corporation, Roscosmos, and the China National Space Administration agreed to cooperate in exploring the moon and outer space, and to create a Joint Data Center on lunar projects. This could include a Russian mission to launch a spacecraft in 2022 and a Chinese lunar mission in 2023, a statement said. Of course we can’t forget that China’s path to claiming global economic dominance has come with increased military aggression, particularly in the South China Sea that it claims as its own. Obama’s pivot to Asia, to be realized through increased trade like the Trans Pacific Partnership (TPP) and increasing its regional military profile, was a failure. The US could not prevent China from annexing 80% of the South China Sea, defend freedom of navigation through the $5-trillion annual maritime trade corridor, or stop China-backed North Korea from conducting nuclear tests. On assuming power Trump pulled the US out of the TPP and began a dangerous war of words with North Korea’s Kim Jong-un as the reclusive nation successfully tested its first intercontinental ballistic missile capable of hitting the US mainland. China is a close ally of North Korea. Meanwhile China continues to expand its military. In early March it was reported that China plans to boost military spending by 8.1% in 2018, compared to a 7% increase in 2017. Maneuvers in the South China Sea demonstrate that Beijing is willing to flex its muscles in a region it sees as strategically and economically important. Why the South China Sea? China is energy-starved and the areas off the coast of the Philippine province of Palawan are oil rich. Despite being rejected by the UN in 2016, China maintains it has control over the entire China South Sea Basin including crucial shipping lanes. China's territorial claims over the waters are disputed by its neighbors – the Philippines, Vietnam, Malaysia, Indonesia and Brunei. China's growing dominance includes building military bases on new, reclaimed islands constructed from tiny rock outcrops jutting from the ocean surface. The United States has responded by sending US warships, refusing to register with air and maritime “identification zones” set up by the Chinese. There is also conflict in the East China Sea between China and Japan. At issue are disputed Islands (Senkakus to the Japanese, Diaoyu to China) and the fishing rights and natural resources those islands would deliver to their owner. In the Middle China Sea, there is China versus Taiwan, which China has claimed as its own ever since former Chinese President Chiang Kai-shek and his Kuomintang followers fled to the island in 1949. Beijing under the leadership of increasingly authoritarian President Xi Jinping's (reappointed with no term limits) at the 19th Communist Party Congress said China must take control of Taiwan by 2050 at the latest, or as early as 2020 according to an article in the South China Morning Post. The Trump Administration thought they could back China into a corner by hitting it with hundreds of billions worth of tariffs, but what it has found instead, is that China has options. It can pivot to Europe (China is already Germany’s biggest trading partner), or it can continue to do what it’s doing, carving a huge sphere of influence in the East through its ties with Russia and 60-odd countries through One Belt, One Road. Perhaps a combination of both. In doing this, the United States will also find that its US dollar exorbitant privilege will continue to wane. This brings up some interesting questions. If China is at war with the US economically, and maybe even militarily if things get out of hand in the South China Sea (or even North Korea), why would it buy its Treasury bills? If China slows or stops buying US T-bills, how will Washington be able to finance its $21 trillion debt? We go through this exercise almost every year. The government doesn’t have enough money to fund its expenditures so it asks Congress to raise the debt ceiling. After much hand-wringing and weeks of sharp-pointed debate, the politicians, wary of being turfed from office for shutting down the government, relent. More Treasuries are sold to pay for the higher debt and the ball just keep rolling. But what if the US can’t find buyers for its debt? What if it had to suddenly raise taxes instead? The call of revolution would be back in the air and the US Military, dependent on funding from government contracts sourced from Congressional districts, would implode. Within weeks its hundreds of foreign bases would fold up like cheap tents. Could this happen? Maybe not right away, but the end of the US dollar is like a snowball at the top of a hill and starting to roll down, becoming larger and faster along the way. We already see moves underway to diversify away from the dollar. It’s happening in Europe, which is trying to create its own SWIFT system on inter-bank transfers, and it’s happening with all the cooperation between Russia and China, who are signing agreements denominated in their own currencies - thus bypassing the US dollar. Think about this. China could pay for its entire Belt and Road initiative out of its USD account - which holds about a trillion dollars. Once that is done and dusted, why do they need US dollars to buy US goods and other commodities? They can get what they need from Russia, Iran, or whoever else the US doesn’t want to do business with, and the countries they sign up to One Belt One Road. Russia has virtually no US dollar reserves. They sold them all. Is this not an indication that the world is turning away from the US dollar and towards inter-country currency transactions instead? “In the process of internationalization of the yuan we have taken sufficient measures that from now on will allow the yuan to be used in trade and investment. Moreover, the yuan has been included in the SDR currency basket. The key procedures have already been carried out… As for the future role of the government or the Central Bank in the internationalization of the yuan, to my mind, it is still possible to do something to establish communication between domestic and international capital markets,” Zhou Xiaochuan said at a press conference [last] Friday. The bottom line is this: No currency lasts forever. The British pound sterling was top of the currency heap for most of the 19th century and the start of the 20th, but it eventually gave way to the dollar. The greenback has enjoyed exorbitant privilege for over 100 years, if you go by the establishment of the Federal Reserve in 1913. It may be time to move over and let natural economic forces take over. Let’s face it, America cannot win a trade war right now. They are running “tremendous” (in Trump language) deficits, an unfathomably large debt, and rely on the printing of money and the largesse of other countries to buy its debt in the form of US Treasuries. The government is almost entirely beholden to foreign entities for it to be able to function. This is no way to run a country. Have you considered what the end of the US dollar could mean for the global economy? If not, perhaps you should.